The Academy Sport Science & Medicine department is here to support your son on and off the pitch. Our sports medicine team work to assess, diagnose and treat any injuries your son may sustain during our academy games and training programme. They are available on training days and will be present at all academy games (please see timetable below). If your son picks up an injury then it is the parent’s responsibility to report this to the relevant medical staff as soon as possible and make an appointment to get the injury assessed. To book an appointment to see one of the physio’s please follow the link below or contact one of them by text of email. Appointments are based on the following days and Venues. • What the illness is? • Have you seen the doctor? • What medication is your son taking? • How long approximately are they going to be off training for? Concussion is an injury to the brain resulting in a disturbance of brain function. There are many symptoms of concussion, common ones being headache, dizziness, memory disturbance or balance problems. The following guidance is intended to provide information on how to recognise concussion and on how concussion should be managed from the time of injury through to safe return to football. Please find below the FA Concussion Guidelines for further information on concussion in football. Protection: Protect the injury from further harm. Rest: No exercise to be performed using the injury area. Ice: It is important not to apply ice directly to the skin as it may burn. A pre-packed gel or plastic bag filled with crushed ice is ideal. Placing a damp towel on the skin will avoid burns. Compression: Applied with a bandage or towel, but not too tight to affect the blood flow. Elevation: Raise the limb, so that gravity can help relieve the swelling. Also never apply ice to open wounds as this may cause infection. However, prevention is better than cure. To this end it is compulsory for all players to wear shin pads at all times when playing or training and failure to bring shin pads will result in that player not being allowed to play. Players should also ensure that they thoroughly complete both warm-ups and the warm-downs during training sessions and games. One parent or guardian must accompany any player attending the physiotherapists/Sport Rehabilitators on the first visit. The physiotherapist/GSR will inform the relevant coaches that a player is receiving treatment. The physiotherapist will communicate on a regular basis with relevant coaches and will have the final say on when the player can resume full training and games and inform the coaches accordingly. 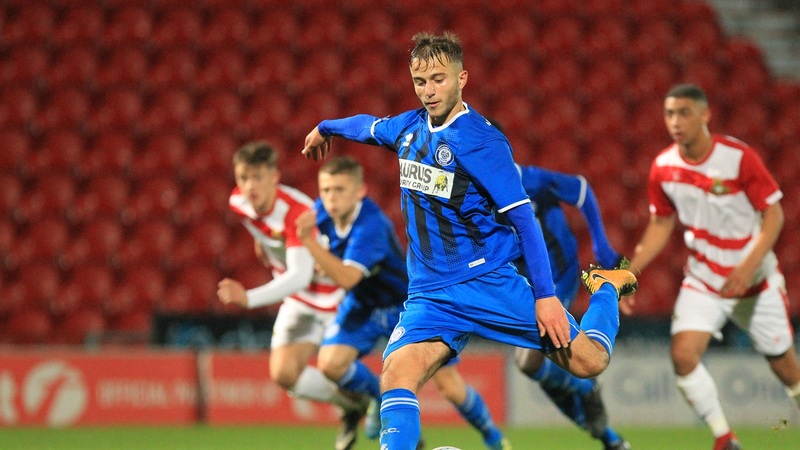 No other person other than those registered with Rochdale AFC Academy will be seen by the physiotherapist/GSR unless agreed with the appropriate staff. An injury report will be completed on behalf of each player which will be filed with the club together with a record of diagnosis and/or treatment recommended by the Academy physiotherapists/GSR. If a player is on medication, they must inform the physiotherapist/GSR in case it may interfere with treatment. No player may resume training or playing until he has been discharged by an Academy physiotherapist/GSR. The form confirming that a course of treatment has been completed must be countersigned by the Academy Manager or the Head Physiotherapist before training or playing in matches may be resumed. Please see the appropriate form on the website. In exceptional circumstances, following a referral from Academy Physio – to Head Physio – to Club Physio, the Club Doctor will be available on Monday’s from 9.00am – 10.00am for all Academy Players. All coaches are trained in Level 2 Emergency Aid in Football (L2EAiF) or BFAS (Basic First Aid for Sport). Please ensure that all injuries are reported to the appropriate staff at the earliest opportunity. It is important that boys do not play or train with injuries no matter how small. It is always advisable to have the injury assessed. In the event of a player sustaining an injury it is the responsibility of the parent/carer to book an appointment with the Physio before arriving to see him on a Tuesday or Thursday night at training. If this is not done then your son will NOT be seen as the Physio may already have other appointments. Sport Science Gym sessions are run on Thursdays and Saturdays to help develop players movement and strength for football. Sessions are designed to incorporate all players individual programmes which are on PMA. Nutrition sessions are based with Simon Bowles and Callum Ryan Jones on dedicated days.